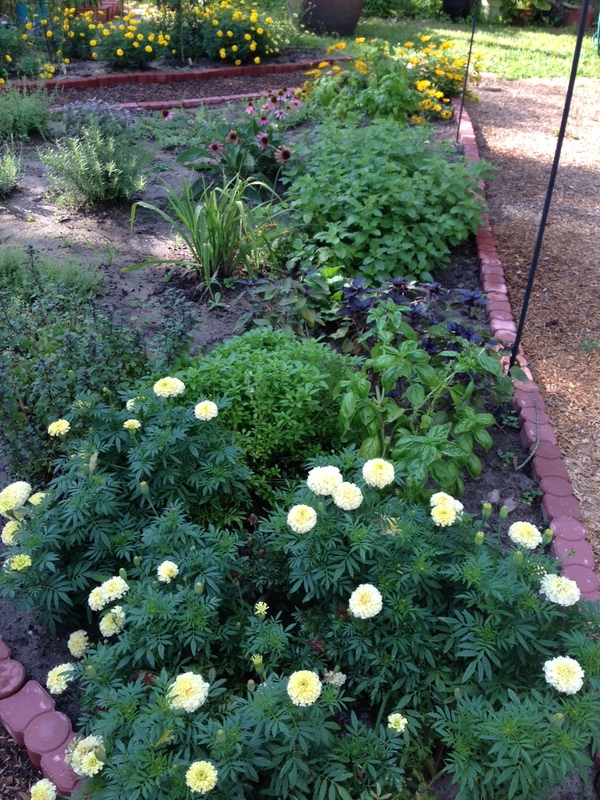 There seems to be a lull in the development of the garden. Either it is too hot or it is raining. I also believe I am trying to accomplish too much in one season. I have come to the conclusion that I must scale back the plans for this year. I would like to finish the back garden first and have the entire area tidied up before moving on, but there are too many plants in pots that need to be put in to the ground before autumn. The thought now is there will be one more bed created in the front of the house and then the focus must switch to putting up a picket fence and arbor. The additional paths will be developed during the autumn and winter months and the additional beds will be developed early next spring. Attention will need to be put on the cottage in the autumn as well. Last weekend I added a rain guard above the door to help deflect rain from falling in front of the door to the cottage and I managed to do a little scraping and removal of dead vines from the structure. I would like to begin glazing the windows soon. This should prove to be interesting. 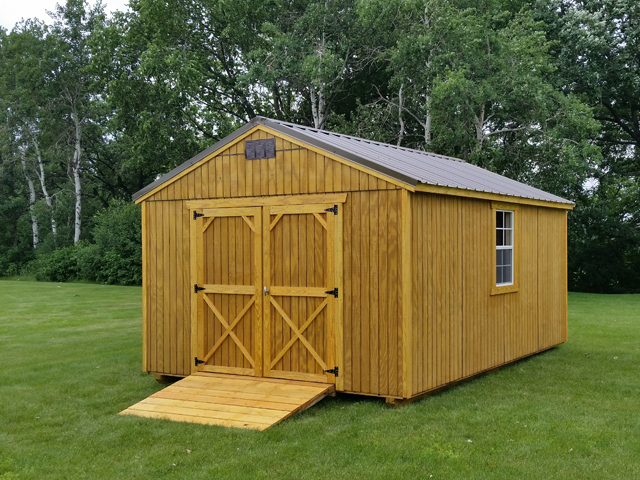 A shed has been purchased and will go up sometime at the end of August. It is going to change the feeling of the potager, perhaps make it feel walled in? I am not sure, but I do know the space the shed will provide is needed. Once it is constructed all the tools and garden tools will be relocated inside and this will free up the cottage to be transformed in to my library/office. An example of the shed, but mine is smaller and has two windows on the left side facing the potager and cottage. We had a freak storm blow through last week. It rained so heavily and the wind was intense. 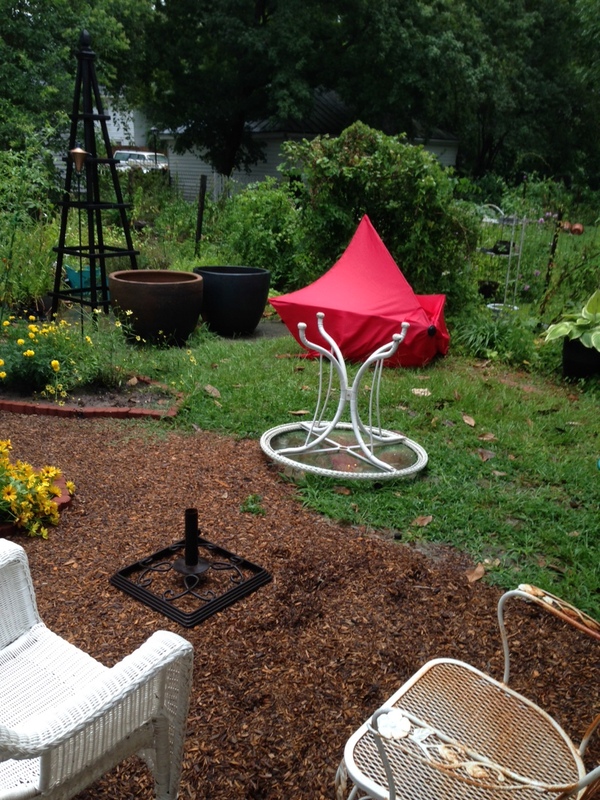 At one point the wind picked up the umbrella and table and carried it some distance. The new umbrella was broken, but thankfully the glass table top remained intact even though it ended upside down! Melissa managed to mend the umbrella until a new one may be procured. During the storm it rained so heavily the potager filled with water. The central part where the fountain is located became a pond with a stream flowing down the path towards the cottage door and side of the house. I believe the cypress mulch and edging bricks have limited the way the water can spread out and dissipate. The water came close to the entrance of the cottage and this has me worried if we were to have a hurricane with consistent rain for hours the water would enter through the door. The plan is to create a French drain of sorts through the bed in front of the cottage and then out into the former Bog of Despair area. The drain would have to be large so I would need to dig a small ditch through the bed and then I would need to remove one edging brick and replace it with a screen of some type so that water may pass, but the cypress mulch cannot. Today I was looking at a few pictures of the potager taken a month ago. It is amazing how quickly it is filling out. 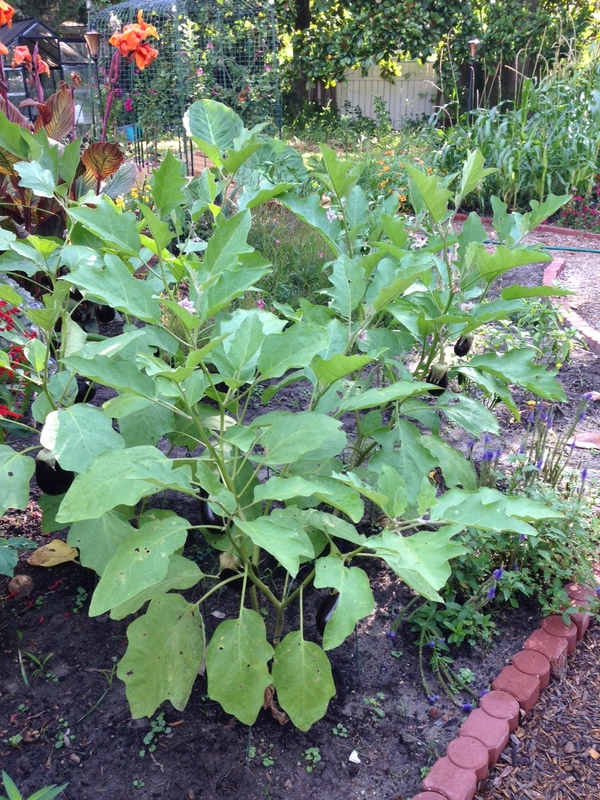 I did not realize the eggplant (aubergine) would grow so large. I had planted the three of them, I thought, a good distance apart, but they seem to have merged and all three have several fruit-growing upon them. 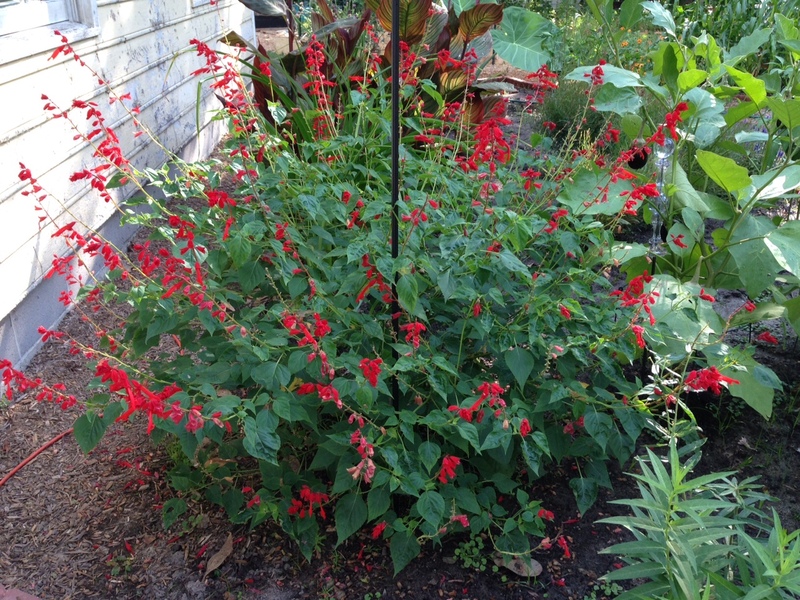 The “scarlet sage” has grown so well that it is beginning to merge with the aubergine (eggplant). 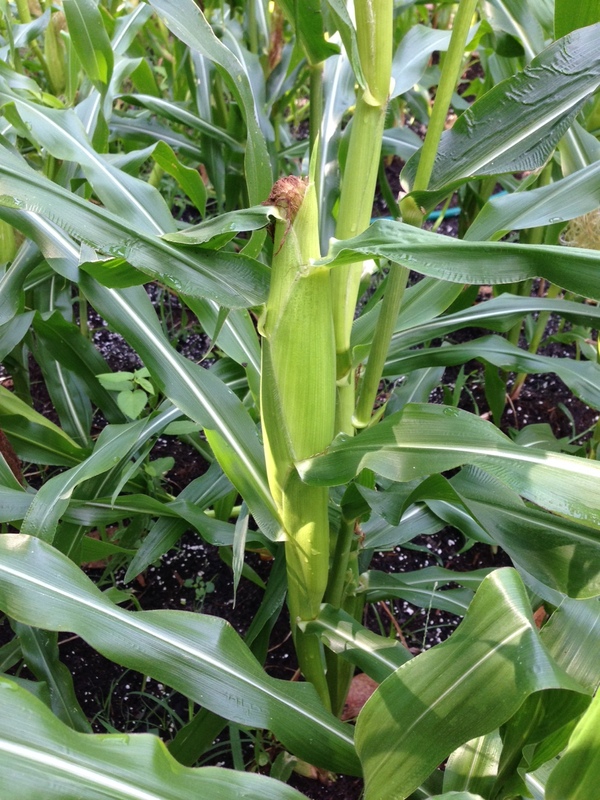 The corn is doing well and almost every one is producing as are the tomato plants, but there is something eating the tomatoes… and it’s not me! 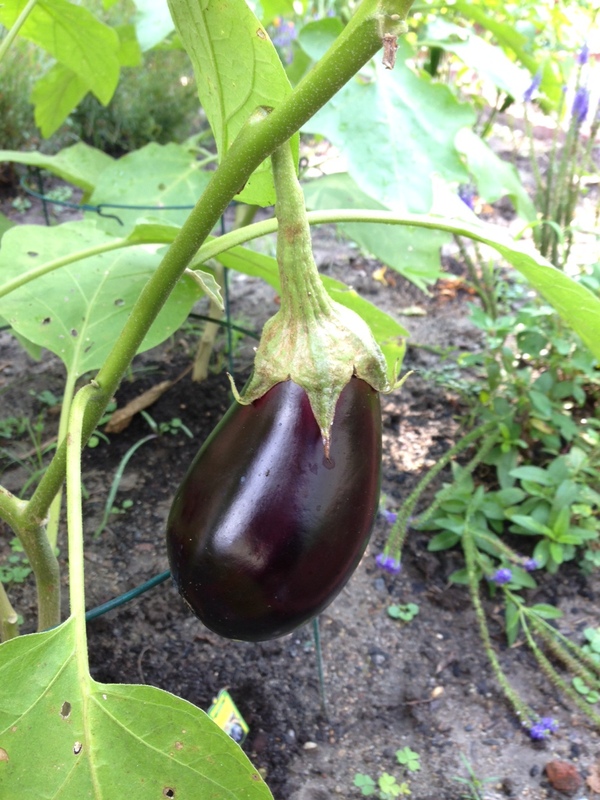 The eggplant (aubergine) is quite prolific. 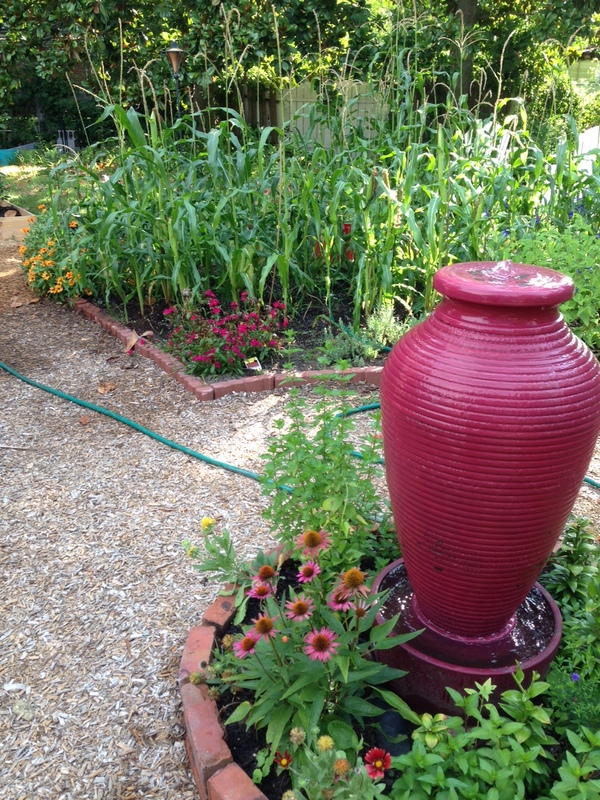 The fountain bed and corn bed have filled out nicely. 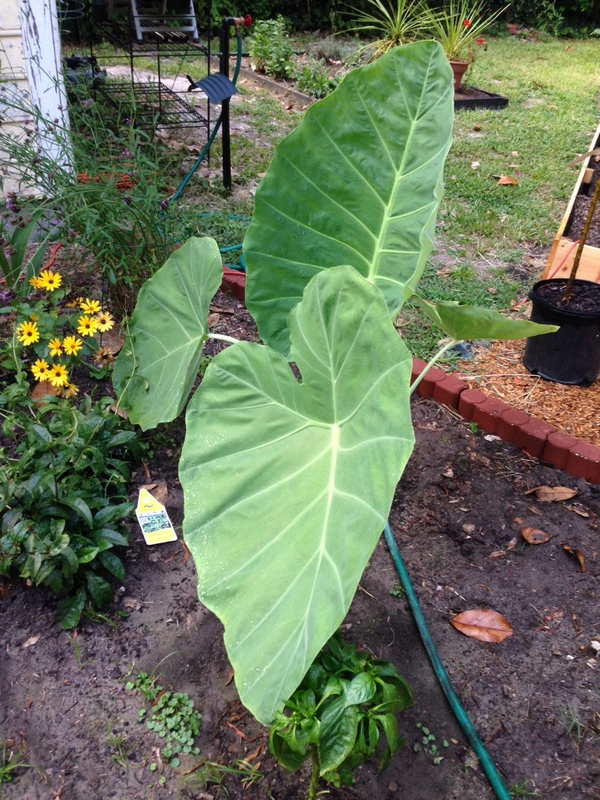 Thai giant elephant ear is very happy in this location. In other news my 83-year-old mother is hoping in her car tomorrow and driving to Florida by herself. She has to be there ASAP because of “important business matters” which I believe she is rushing into too fast. I am unable to take time off from work since I have used up most of my annual leave and she can’t wait until September when I would have a day or two to spare.